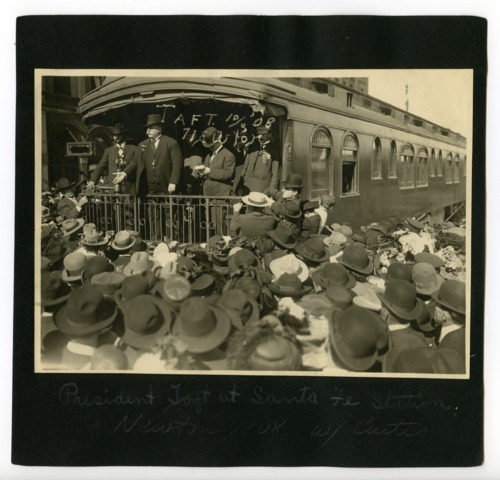 This sepia colored photograph shows William Howard Taft, the Republican candidate for the U.S. Presidency, speaking to the crowd at the Atchison, Topeka & Santa Fe Railway Company depot in Newton, Kansas. Standing to the left of Taft is the U.S. Senator from Kansas Charles Curtis. Taft won the November election by defeating the Democratic candidate William Jennings Bryan to become the twenty-seventh President of the United States.